Best of this type so far from the 2000 wines. Simply put, this is the best of this type of wine that I have tasted yet from the 2000 vintage. From the first smell of the cork and the deep dark red-black colour of the wine this bottle was good news. 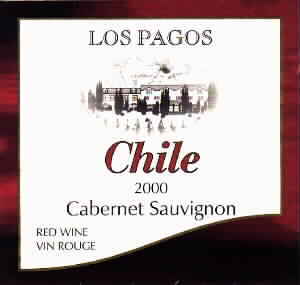 A good Cabernet Sauvignon from this part of the world should have a good body and a strong, almost heavy taste and this wine has them both. There is a slightly rough aftertaste but nothing too bad and the aroma is much more pleasant than the other wines of the type from this year at this price. DeM3.79 from Extra in Germany.